Room rates: Hotel next to the Danube: 58 Euro incl. breakfast, taxes! Why do we recommend: Best breakfast in the 3 star category hotels of Budapest, absolutely central, breath-taking view from some rooms. Why do we recommend: Located in the very heart of Budapest, situated in the famous pedestrian street; Váci utca. You just can`t be more central..! Why do we recommend: The only 5* hotel in Budapest with excellent wellness and thermal services. Why do we recommend: Pay 3, stay 4 and get a free ticket to the Széchenyi Spa! Room rates: Take adventage of our opening rates! Why do we recommend: The newest 5* luxury hotel of Budapest: Buddha-Bar Hotel Budapest Klotild Palace. Book you room now and enjoy our opening rates! We guarantee that you will not be dissappointed! Why do we recommend: Situated on the river bank of Danube opposite of the Parliament. We believe that it is the best Novotel in Budapest. 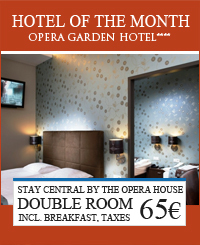 Room rates: Special offer: double room 52 Euro! Why do we recommend: New, trendy, central, offers special interior solutions and modern design. The Vampire Suite is.. better to check the photos. Why do we recommend: Uniquely designed hotel offering breathtaking panorama over Budapest and Buda hills. Book your hotel with us and receive a Budapest tour FOR FREE!